Wow, I can hardly believe it! The Pan Am Games are almost here, a mere week away. How did that happen?! The Pan Am Torch is now making its return to Toronto after more than a month on the road, in the sky and traversing through the water — in fact, today is Day 34 of its journey. Starting tomorrow, Saturday July 4, until next Friday, when the Torch will light up the Opening Ceremony for the Games, you can find the Torch in all corners of the city. I’ve listed the times and locations for the Torch in the city, so once you’re ready to join the fun, take a look to see when the Torch will be closest to you! Please keep in mind that times listed below are simply estimates, so make sure to visit the Toronto 2015 website, or to follow the Torch’s progress on social media with the #CelebrateAndShare hashtag. Happy Fourth of July to Team America and our other visitors from the United States! Today sees the Torch coming from Brighton, Ontario, all the way to Toronto, where it will arrive in the evening. Join the celebrations at the Prince Edward Viaduct, located on Bayview Avenue, from 7 pm until 8 pm. This is an artist’s rendering of the Viaduct’s “luminous veil” lit up. Image source. What’s most exciting at this location is the use of a shimmering light display, called the “luminous veil”, that will run throughout the relay. The lights actually change in response to temperature and the direction and velocity of the wind, so it should make for an eye-catching scene — great for any amateur photographers who want to capture this special moment with a unique backdrop. For music lovers, a Juno award-winning *mystery* band will also be playing. Read more in this neat Metro News article. A performance by T.Dot Batu, at last year’s Afrofest. Image Source. In the spirit of celebrating culture, I recommend catching the Torch at the 27th Annual Afrofest, running from July 4 to 5 in Woodbine Park. The Torch will be passing through the festival between 7 pm and 8 pm. You’ll be able to enjoy live music performances, workshops, spoken word artists, dance groups, a children’s village filled with fun activities, and a delightful marketplace with food and other vendors. Best of all, admission is free! Below you can find the rest of the Sunday Torch relay locations. This seems like a fun Torch relay location to bring the kids. Image source. My recommended location for today? One of my favourite locations in the city — the Ontario Science Centre. I go once every year or two to get caught up with any new exhibits. Marissa Papaconstantinou, who inspired the bionics and prosthetics exhibit at the Science Centre, will be carrying the Torch here. Marissa, now 15, was born without a right foot and has been working hard towards competing in the 2016 Paralympics. 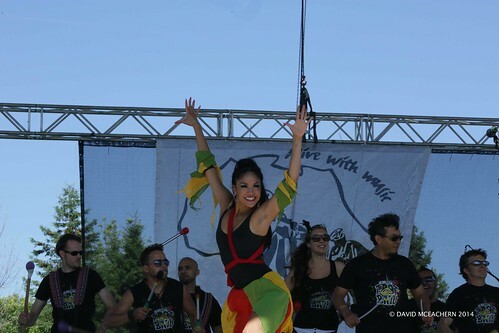 Other special guests and activities include First Nations dancers, ground shakers and drummers; Pachi, the Toronto 2015 Pan Am and Parapan Am mascot; and a variety of sports-inspired games and challenges. Today offers two very unique options. One of them, Montgomery’s Inn, will be hosting a small celebration for the Pan Am Torch. 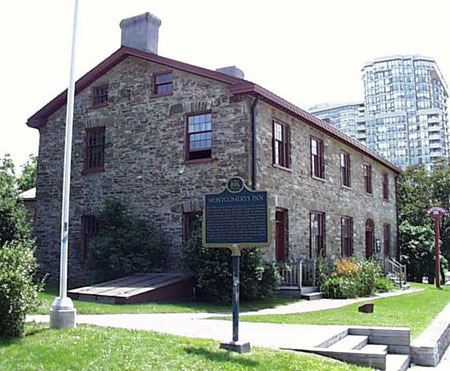 History aficionados will find the building a great location to peer into Etobicoke’s past. Did you know that Montgomery’s Inn was actually built in 1830? It wasn’t until 1975, however, that it officially opened as a community museum! What a picturesque location! Image source. The celebration at Albion Arena also looks quite promising. Drop by between 5 pm and 9 pm for free music and performances, sports activities, food trucks and, of course, the Pan Am flame at 7 pm. This is a great event for families. York students and community members should consider popping by the Driftwood Community Centre around 10:30 am to get a glimpse of the Torch. Also available will be multicultural showcases, youth martial arts presentations, special guests and more. A nice little square for festivities! Image source. Mel Lastman Square will host festivities from 11 am until 3 pm with free music and atmospheric performances (such as live music and art exhibitions), sports activities for all ages and food trucks. The party picks up at Earlscourt Park at 5 pm, with the Torch set to make an entrance at 7 pm. Look at that Torch! Image source. This will be the 40th day on the road — and one of the busiest yet. My vote’s in for Nathan Phillips Square, with a fun four-hour event starting at 5 pm. Much like the other celebratory events, the one in Nathan Phillips Square will be offered free of admission with sports activities for all ages, fine eats and many performances. The latter include the Essencia Arts Collective, the Maracatu Mar Aberto Afro-Brazilian troupe, Les Chiclettes, a breakdancing showcase and DJ Grouch. No lack of variety, right? And now, for the grand finale and the beginning of the Games themselves! Today’s best option seems fairly obvious — the Ontario Celebration Zone (Harbourfront Centre), which will welcome visitors daily from 10 am to 10 pm between July 10 and the end of Games on August 16! You will able to immerse yourself in all-day live entertainment, art installations, food, and activities for children. More specifically, on this Friday you can enjoy the band Rebel Coast at 3 pm and the Downchild Blues Band at 5 pm. You will also find a 400-foot zip line, a 40-foot rock climbing wall and a so-called adrenaline jump (which I’m guessing is a super fancy and awesome trampoline), to name just a few possibilities. If you haven’t had a chance to see the Torch or participate in any of the community events yet, don’t miss out on this one! The Opening Ceremony might look something like this. Image source.